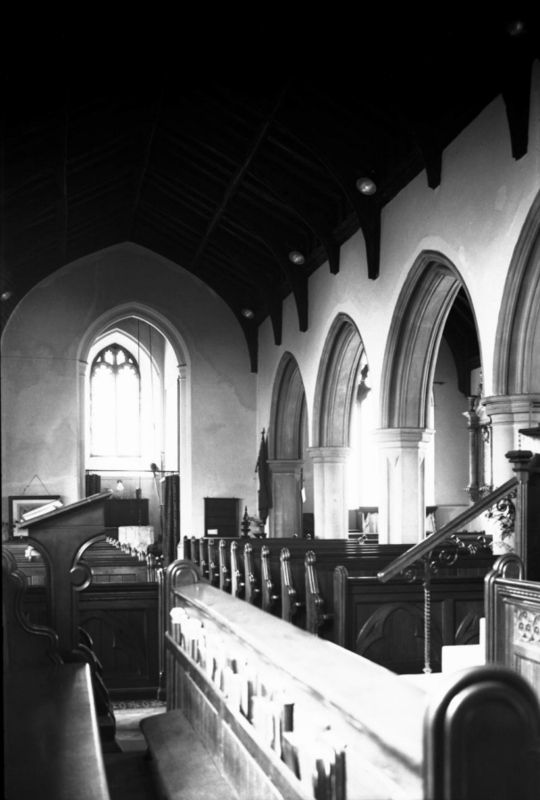 On Monday the 23rd of May 1938, George Plunkett stood at the St Bartholomew's Close entrance to the graveyard of the church of St Bartholomew, Heigham, and took the photograph on the left. It was an overcast day, which only seems to add to the atmosphere of what was a substantially Victorianised building, the east end of the 19th Century south aisle juxtaposed slightly awkwardly with the continuous nave and chancel beside it. The gable cross of the matching north aisle peeps over the roofline. 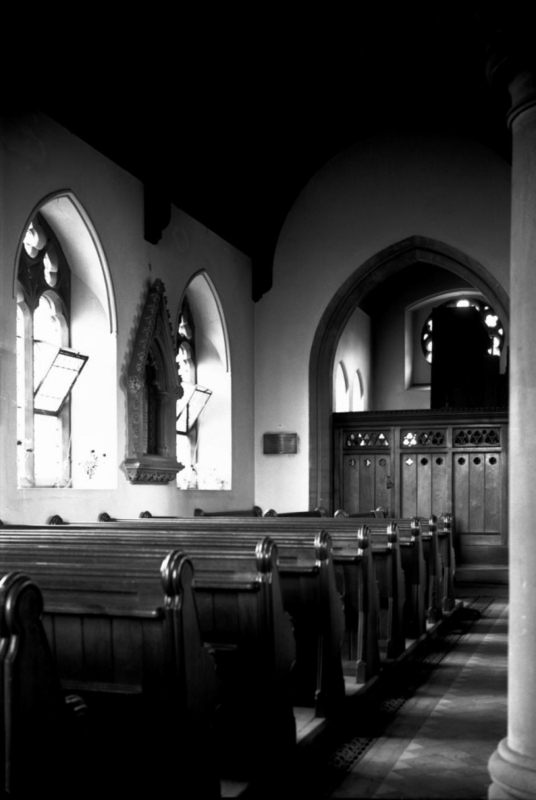 There is no clerestory, and both aisles appear taller than the nave, giving it something of the appearance of a long animal poised to spring. The 15th Century tower, with what look like 18th Century elaborations to the battlements, is elegant, but rather slight in proportion to the rest of the building. 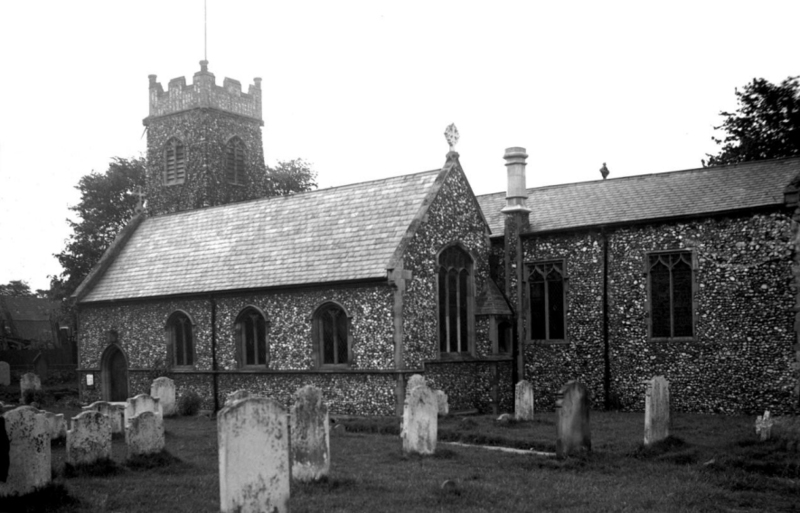 The parish of Heigham is just about as close as it is possible to be to central Norwich and still be outside the walls, and long before the 19th Century this was a busy place. By the middle of the Victorian era the part of the parish to the north of the Dereham Road was a tightly hemmed area of working class terraces, with street corner shops and pubs, some of which still survive. The area was bound to the north and west by the river, and by the long curve of Waterworks Road, the huge waterworks which served the city also providing one of the district's employers. 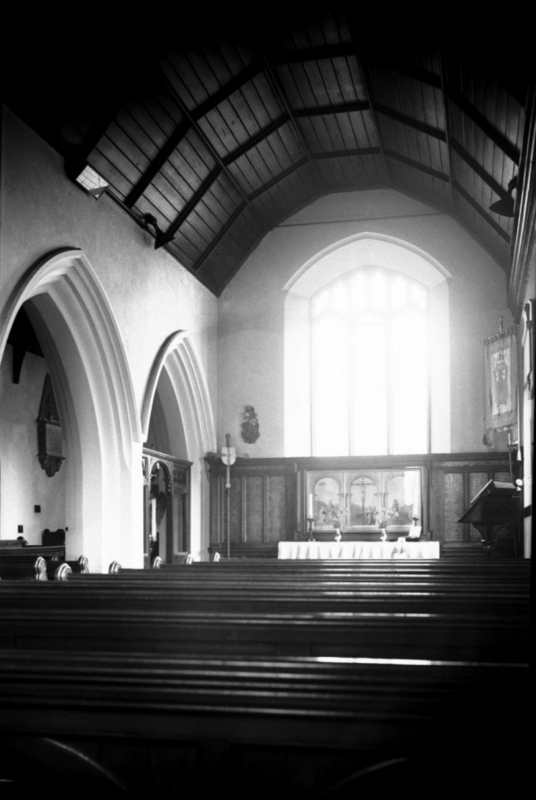 The parish church for this growing area was not only enlarged at this time, but also supplemented by new churches: St Philip on Heigham Street, which was demolished in 1975, St Barnabas, and also St Thomas up on the Earlham Road. The overcast skies on the day of George Plunkett's visit to St Bartholomew could not fill the interior with much more than a kind of gloom. It can never have been very bright; with hindsight, one might even say it looks like a sense of foreboding. The font is pretty enough, with its shields depicting the Instruments of the Passion and the Holy Trinity, but at the east end of the north aisle, the organ screen blocks any light from that direction. The end of the south aisle, however, is full of light from the east window above a pretty altar backed by a triptych of the Crucifixion. 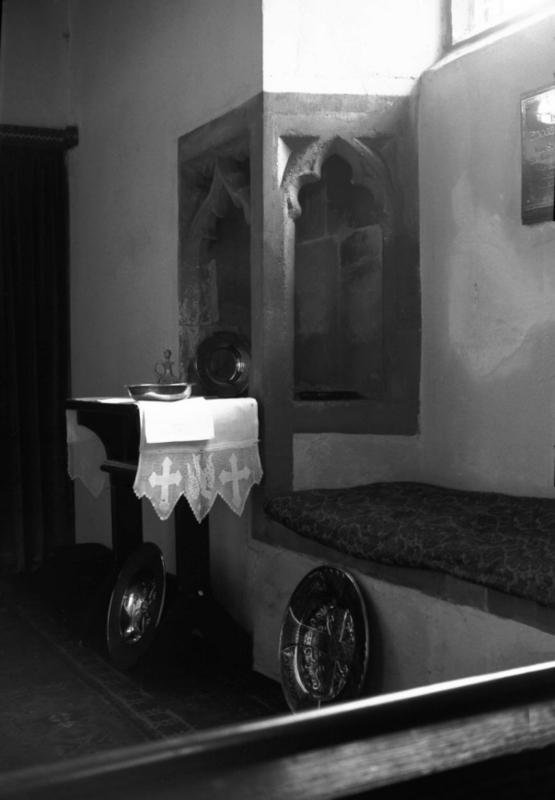 Large, vague monuments line the chancel, and apart from the font, the only evidence of the medieval days of the church is an angled piscina and the ghost of a sedilia on the south side of the chancel. It was almost three years later, on the night of Monday, 27th of April 1942, that St Bartholomew was pretty much destroyed by German bombing. This was the first of the great Baedeker Raids on the city, when the Germans took revenge on historic British towns and cities for the Allied destruction of Lubeck the previous month. Ironically, the bulk of the violence on this April night happened to the west of the city centre: in St Benedict, along the Dereham Road, and here in Heigham. It was the first serious bombing raid on Norwich for eight months, and people were ill-prepared: of the 340 Norwich citizens killed during the bombing of World War Two, almost half of them died on this night, most in the maze of streets that fringed the north-western line of the city walls. That night, St Bartholomew, and St Benedict half a mile or so to the south-east, became the first two medieval Norwich churches to be destroyed by the bombings. St Paul, St Julian and St Michael at Thorn would also be destroyed over the next two months. Of the five, only St Julian was ever rebuilt. The tower survives at St Benedict, but of St Paul and St Michael no trace at all remains, other than street names. The tower of St Bartholomew also survived - but only just. 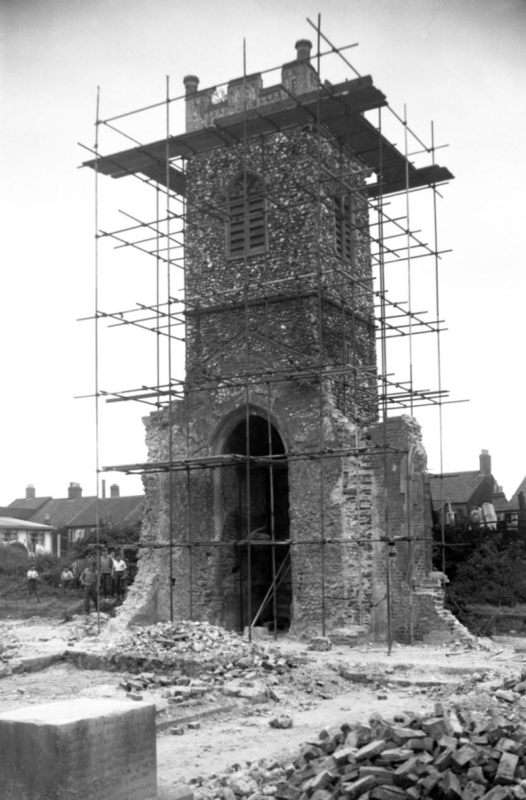 In the summer of 1953, after the ruins were cleared, George Plunkett took the photograph on the left, showing scaffolding in place as work was carried out to make it safe. It is worth pointing out that the towers of St Paul and St Michael also survived, both in rather better condition than that of St Bartholomew. But the sites of St Bartholomew and St Benedict were not required for road widening, whereas those of St Paul and St Michael were, and so both were finally demolished in the 1950s. 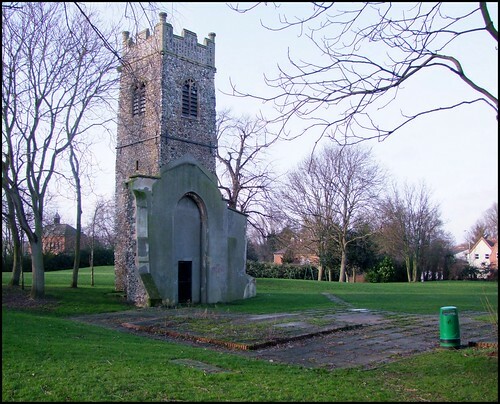 The closely packed graveyard of St Bartholomew which George Plunkett had photographed in 1938 was grassed over, and the site became a public park, with its main entrance on Waterworks Road. 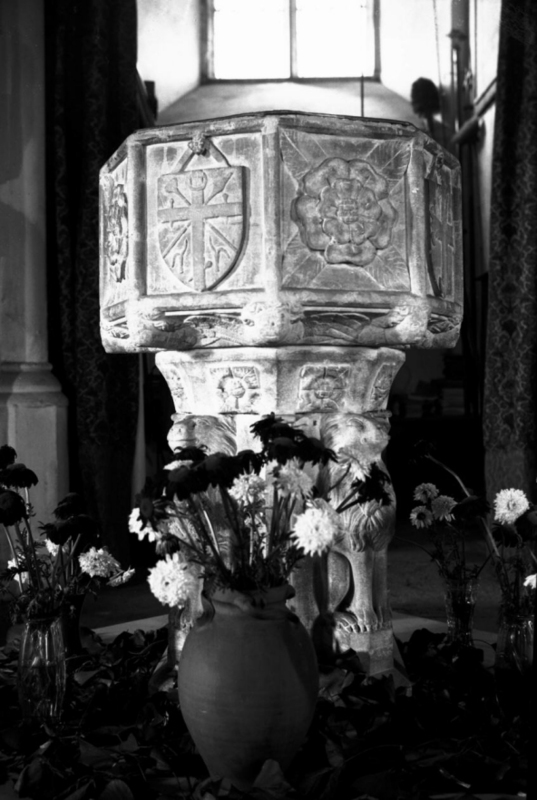 Nothing much else remains - the font which George Plunkett photographed was destroyed. 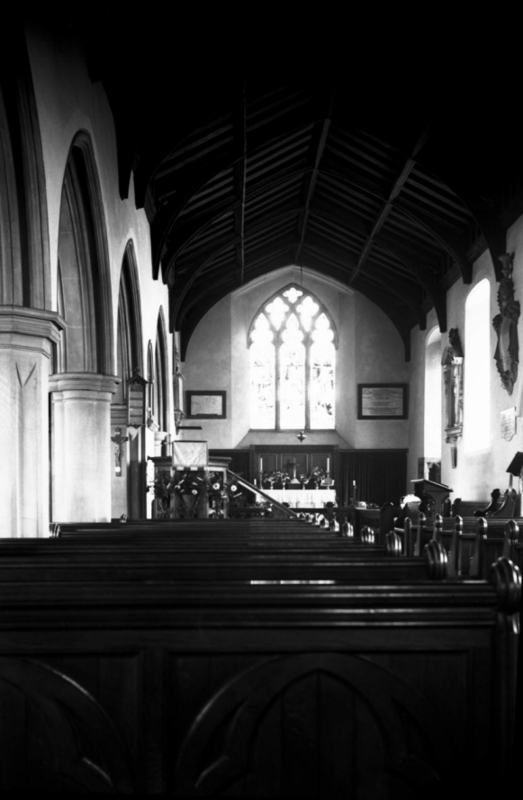 It is easy to stand beside St Bartholomew today and imagine the church which was once here. The paved outline of the south aisle survives, as does that of the nave beside it. Chancel and north aisle are now gone, but one of the base course stones, probably from the juxtaposition of north aisle and chancel, is still there. It is not a particularly attractive ruin: a park bench and a rubbish bin suggest a municipal recreational purpose, but in fact this is rather a lonely spot, and it wouldn't take much for it to become overgrown if it was neglected. A children's play area in the north-west corner of the park seems an unlikely companion for it. And there are other ghosts that survive from before the Blitz. At the Waterworks Road entrance, the original gate posts are still in situ. And St Bartholomew's Close itself still survives, an unpaved lane of substantial 19th Century houses lining the way up which most parishioners must have come on a Sunday. After the bombs, the congregation took over the old Heigham Methodist church a couple of hundred yards further up Nelson Street, and remained there into the first few years of the 21st Century. Today, St Barnabas is the parish church for this area. As St Benedict's Street becomes Dereham Road, it does not make for one of central Norwich's more attractive districts. The vast Toys R Us superstore and its companions are an unlikely and unwitting legacy of the Luftwaffe's work. The towers of St Benedict and St Bartholomew are perhaps more appropriate memorials to that night, and to several other terrible nights in the spring and summer of 1942. St Bartholomew can never have been one of suburban Norwich's more attractive medieval churches. But a remnant of it survives; to tell us, if we should forget, that Heigham has not always been a 19th Century industrial suburb, but that for a millennium or more it had a proud life of its own.